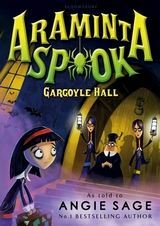 When Araminta and her best friend Wanda go on a school trip to Skeleton Island, they don’t expect to get stranded there overnight. And they certainly don’t expect the island to be haunted by ghostly skeletons of pirates! It certainly makes for a spooky sleepover. Luckily these ghoulish pirates just want someone to help them find their lost treasure, then they’ll happily set sail on their ghost ship once more. But someone else wants the treasure for themselves – can Araminta find what is lurking in the depths before it’s too late?